The following models were analyzed using the Import Fuselage capability of AeroWindTunnel. This collection is part of the AeroWindTunnel installation file and is located in Glider_Examples.zip. 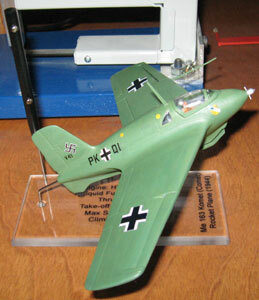 New to the collection is the Me-163 rocket plane, HTV-3X Blackswift, XCOR Lynx Mk.1 and the AeroEagle model airplane in addition to the X-30 NASP, HL-20 and F-16 Type Jet Airplane. in addition, several other gliders and examples from text books are included in the examples file. Screen shot from AeroWindTunnel's Fuselage Geometry screen for the HTV-3X Blackswift. Screen shot from AeroWindTunnel's Coefficients Plots screen for CD, CL and L/D for the F-16 Type Jet Airplane. Details for this analysis were derived from the March 31, 2008 issue of Aviation Week and Space Technology magazine. The Space Hopper article on pages 24 and 25 stated the Lynx Mk.1 is 27.9 feet long with a wing span of 24.2 feet. In addition, the article said the vehicle is "conceptually similar in appearance to the Boeing X-20 Dyna-Soar hypersonic vehicle canceled in 1963". From start to finish the generation of the Lynx Mk.1 simulation took a total of one hour because only plan-view and side-view shapes need specification. Time consuming CAD definitions and DXF file generation are not required for AeroWindTunnel model generation greatly increasing ease of use and aerodynamic analysis productivity. The Me-163 rocket plane was developed during World War II by Germany as a last ditch effort to stop allied bombing raids. Development of this revolutionary rocket-powered interceptor started in 1938 under the title Project X. AeroWindTunnel results for drag coefficient (CD) and climb rate compare exactly with results found in Fluid Dynamic Drag by S.F. Hoerner on pages 14-9 and 14-10 where in TABLE A, CD = 0.012 and in Figure-7, Climb Rate = 11,600 feet per minute for the rocket plane. In addition, Thrust Required for the climb angle computed using climb rate and airplane velocity from Fluid Dynamic Drag agree within 4% for the thrust of the Walter HWK 109-509A-1 liquid fuel rocket motor which is 16,671 NT. The results screen shot below illustrates AeroWindTunnel's results for CD = 0.012, Climb Rate = 11,600 feet/min and Thrust Required = 16,008 NT. Please request the new Me-163 analysis if you already own AeroWindTunnel by contacting John Cipolla. 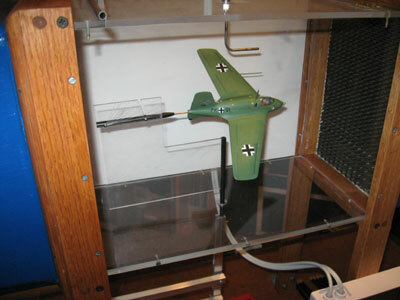 The project file and airframe geometry for the Me-163 are not included in the Glider_Examples.zip file at this time but will emailed upon request.